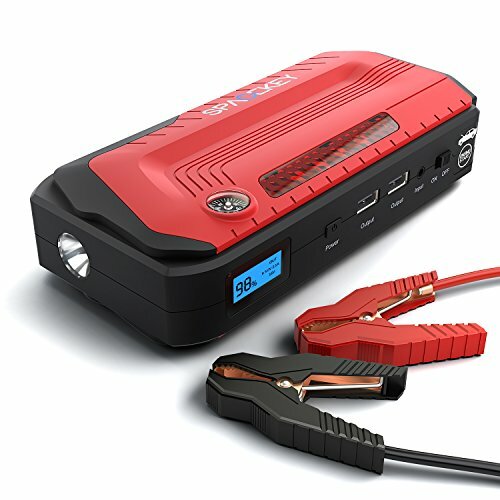 Spacekey 800A Peak 18000mAh Portable Car Jump Starter (Up to 6.5L Gas or 5.5L Diesel), Auto Battery Booster, Phone Charger, Power Pack with Built-in Dual Output, Compass and LED Flashlight. Sleek design with a fabulous quality semi-hard case and 3-mode LED light (light/strobe/SOS). It's a potential emergency life saver when you go camping, on picnics and outdoor adventures. Dual USB port includes one smart USB charging port for charging your smartphone much faster.